Extending the promotional fun for another year, 2017 Panini Cyber Monday celebrates the online sales holiday with a set specifically for case breakers. More basic than its Black Friday counterpart, 2017 Panini Cyber Monday largely follows the blueprint for the 2016 promo. The 50-card base set offers baseball, basketball, football, racing and soccer subjects with a green-heavy design. This includes top NBA, NFL and MLB rookies using either a professional or college focus. 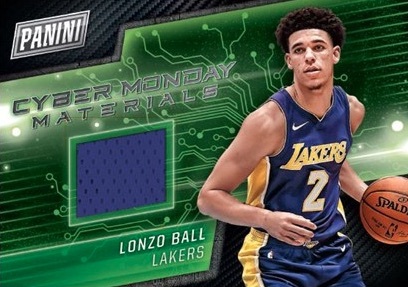 As far as the hits, the 2017 Panini Cyber Monday checklist contains Cyber Monday Materials cards with a horizontal layout. These also have parallels limited to 25, 10 or one-of-one. In addition, Autographs are randomly inserted. 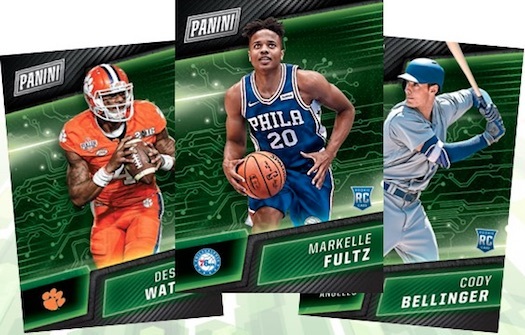 Issued by distributors to breakers for case purchases during the promo period, 2017 Panini Cyber Monday packs coincide with 2017 Immaculate Baseball (32 packs per case), and the breaker-exclusive 2017 Rookies & Stars Football hobby set (24 packs per case). Dig into sets related to 2017 Panini Cyber Monday with our other detailed profiles.